What do we do now with the used clothing items, paper, glass, the oil used in cooking, batteries, printers, used tires, plastic (bottles)? What could we do differently (better) for the environment? How do we convince more companies to integrate circular economy principles of reduce, reuse, recycle? How do we convince consumers to reduce, reuse, recycle various items? RECICLETA (Viitor Plus association): Management of paper, cardboard, PET, aluminum. Core question: How to strengthen the capacity of social enterprises based in Bucharest? A space (online and onsite) promoting a new approach to promote creativity, entrepreneurial thinking and skills for designing innovation in close cooperation with the communities in which the University is embedded. Hosted by the Bucharest University of Economic studies. A learning tool to achieve the main goal of the project: to develop, establish and maintain a new framework for linking University to its local communities. A starting point for co-creation and co-founding of local entrepreneurial solutions to local problems. 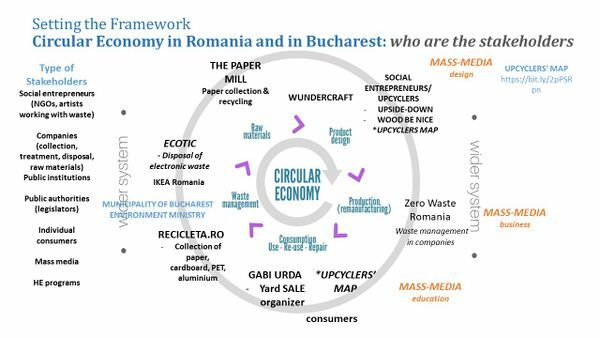 A voice for the local challenges and the change makers (social entrepreneurs, businesses interested in implementing circular economy principles, etc). This page was last modified on 21 February 2019, at 18:22.